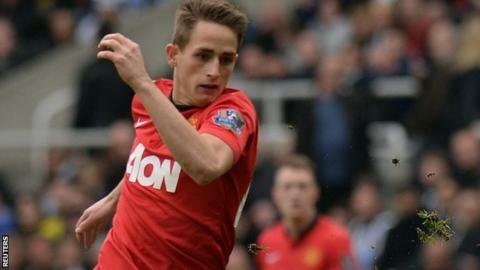 Manchester United winger Adnan Januzaj has decided to represent Belgium in international football. Belgium coach Marc Wilmots made the announcement on Twitter and said he was "delighted" by the player's decision. Januzaj was born in the Belgian capital of Brussels to Kosovan-Albanian parents and joined United in 2011. The 19-year-old could have played for Kosovo, Albania, Turkey, Serbia and, potentially, England, but could now make Belgium's World Cup squad. A 30-man provisional squad is due to be named on 13 May. He has yet to play international football at any level, but was invited to play for Kosovo in a friendly in March. Signed by United from Anderlecht for a reported fee of £297,000, Januzaj could have played for England from 2018 assuming he remained in the country. He qualified for Albania through his parents and Turkey through his grandparents. He could also have represented Serbia after Kosovo declared independence from the country in 2008. Januzaj made his league debut for United as a substitute in a 2-0 win at home to Crystal Palace in September and scored both goals for the defending Premier League champions in his first start, a 2-1 victory at Sunderland, on 5 October, 2013. Following Januzaj's goalscoring full debut, Wilmots said he wanted him to play for Belgium, while England manager Roy Hodgson admitted he had been keeping an eye on a player whom he described as a "real talent".